The fragrance product of the 21st century! 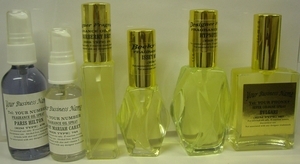 All the advantages of perfume body oil - long lasting fragrance, no alcohol, moisturizes skin - with the convenience of a spray. Contains 30% pure perfume oil in a silk base with aloe and vitamin E. Stronger than perfume at a fraction of the cost! Be the first in your area to profit with this cutting edge product.